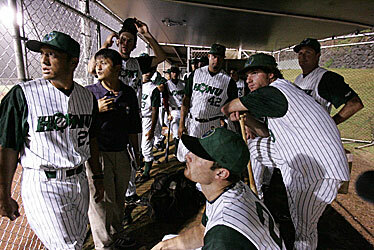 The North Shore Honu waited in the dugout at Hans L'Orange field yesterday while the rain confirmed their championship. The North Shore Honu earned their second consecutive Hawaii Winter Baseball crown -- just not exactly the way they intended. By virtue of their league-best 26-12-1 record, the Honu were awarded the HWB title when their championship game against the Waikiki Beach Boys was rained out last night at Hans L'Orange Field in Waipahu. The Honu dominated the four-team league -- especially their divisional rival, the West Oahu CaneFires, whom they went 13-2 against -- with a league-best ERA of 3.65 and an all-time HWB batting average record of .273. Milwaukee Brewers third base prospect Mat Gamel was named league MVP, batting .333 with a league-high eight home runs and 25 RBIs. It was only the second rainout of an HWB game all season, with the other coming on Halloween. The rain's timing was inconvenient for Gamel and the Honu, but Gamel admitted it was worse for the BeachBoys (19-19), who had no chance at taking down the favorite. "It's mixed emotions," Gamel said. "A lot of us are tired and ready to get home. We've been playing since February. In the same breath, it's the championship game and everyone's itching to play." Brett Sinkbeil and Takashi Kamoshida provided an effective one-two punch on the mound for the Honu; Sinkbeil went 3-1 with a 1.64 ERA and 33 innings pitched, and Kamoshida had a 0.98 ERA with 45 strikeouts in 27 2/3 innings. Honu manager Kevin Bradshaw came away impressed with his team's sustained effort over the 39-game season. "Outstanding. To be in Hawaii, down in Waikiki, and to stay focused. ... When they got to the field, they were focused on coming out and winning a ballgame." "We just played together as a team the whole time," Gamel said. "Our pitchers pitched well and we played good defense. It was never just one person, it was a team effort." League president Hervy Kurisu said the overall level of play was significantly higher than in the past -- going back to the HWB's original debut in 1991 -- despite the Honu owning the only winning record this year. "With the coaching staff and talent that they had, they just dominated the league," Kurisu said. "I notice that the talent level is much, much better than it's been in the past." In its second year since its resurrection, Hawaii Winter Baseball had to adjust to the unavailability of Les Murakami Stadium because of turf renovations. Chairman Duane Kurisu said Major League Baseball considered canceling HWB this year as a result of having one playable field instead of two, but in the end the league was able to "go with the flow." "We learned to overcome adversity and play on one field," he said. "(MLB is) actually really happy with what happened. We look forward to going back to Les Murakami next year." The rain kept coming and coming, forcing a brief postponement on KFVE and eventual calling of the game. Fans who attended were reimbursed and given free food and beer.